Wikipedia defines them as ‘ideograms and smileys used in electronic messages and web pages.’ The word emoji comes from the Japanese word ‘e’ (meaning picture) and ‘moji’ (meaning character), and the widespread popularity of these pictographs (pictorial symbols) can be assessed from the fact that they are today so ubiquitous we frequently fail to notice them in our day-to-day correspondence, social media posts and replies. Emoji first appeared on Japanese mobile phones in 1999, the creation of Shigetaka Kurita, a Japanese interface designer, then working for the mobile phone operator NTT DoCoMo. Kurita was inspired by the varied symbols used on TV weather reports, Japanese Manga art and Chinese characters. His initial 176 emoji were designed across a rudimentary 12×12 pixel setting and intended to facilitate mobile phone communication over just the NTT DoCoMo family of mobile platforms. In fact, the availability of emoji was advertised as a differentiating and competitive factor that other Japanese mobile operators did not provide. However, neither Kurita, nor NTT DoCoMo could patent these early emoji since they were considered as nothing more than a collection of pixel-based images. But as often happens, it takes a series of seemingly unrelated events to create a global phenomenon. Early in 2007, the global giant Apple Inc. was about to introduce the first version of the iPhone into the challenging Japanese market. Apple recognised the national craze for emoji and how these graphics were essential in order to succeed in this Far-eastern market. As a result, the Japanese version of the iPhone was introduced with a keyboard that supported Apple’s version of emoji. The company (wrongly) assumed that such emoji would not be required anywhere else across the globe. In fact, the first North American and European iPhone models did not support emoji, unlike their Japanese counterpart. But Apple users across the globe became aware of these emojis, and before long, installing a Japanese keyboard on non-Japanese iPhones, to gain access to emoji, became a widespread trend. Needless to say, this did not go unnoticed and eventually, most of the other mobile phone manufacturers were providing a customised suite of proprietary emoji on their respective devices too. However, the unforeseen proliferation in the use of emoji within text messages produced a serious compatibility issue. Emoji sent across similar devices presented no problem, but when they were sent from one device to a competitor’s, these tended not to display as intended. And this is where the story of emoji starts to somehow border on something resembling the Galactic Senate in the Star Wars saga – fortunately without the Republic’s never-ending strife. The issue of compatibility across devices and operating systems was not unique to emoji. As far back as 1987, a group of engineers from Apple and Xerox foresaw the problem of transmitting language-specific characters from one device (e.g. computer, mobile phone, etc.) to another, albeit manufactured by a different supplier. These engineers decided to establish a common and international standard, called Unicode, to ensure cross-platform compatibility. Unicode is ‘an international encoding standard for use with different languages [in] which each letter, digit, or symbol is assigned a unique numeric value that applies across different computer platforms.’ As an example, a Maltese computer-user typing the Unicode standard for the local characters ċ, ġ, ż, ħ or Ċ, Ġ, Ż, or Ħ can, owing to the universal adoption of the Unicode Standard, expect everyone else to see the same set of characters, no matter what computer or mobile platform, device, application, language or location. The international and multilingual Unicode Standard is maintained by a group known as the Unicode Consortium, a non-profit organisation based in California. To date, the Unicode Consortium has assigned a shared code to more than 110,000 characters and covers the majority of written languages. Sometime around October 2010, the Unicode Consortium, ventured beyond language Unicode and adopted the first six-hundred emojis in an attempt to create a common standard across all the different mobile phone operating systems. 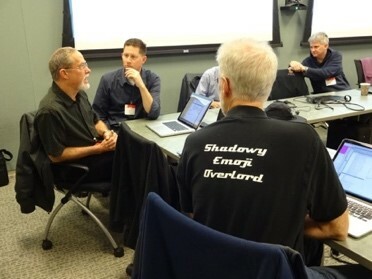 The Consortium is run by a 66-year old software engineer called Mark Davis, known as ‘The Shadowy Emoji Overlord.’ He is assisted by a group of volunteers, known as the ‘Emoji Council of Elders,’ mostly representatives from such global giants as Apple, Microsoft, Google, Facebook, Twitter and Intel, amongst others. The Emoji Council of the Elders has decisive power to approve or refuse the introduction of a new emoji and acknowledge that they are the gatekeepers of the colourful world of pictographs. It is widely acknowledged, for example, that the Council of the Elders have persistently denied emoji relating to “Justin Biebers, deities, and dead people” although different types of foods have regularly been approved. The oft-cited critical factor taken into consideration when approving a new emoji is often the level of expected usage, well aware that once an emoji has been approved there is no established procedure to ever remove it. Only around seventy new emojis are approved every year. On the 5th of June 2018, the Emoji Council of the Elders released version 11 of the emoji Unicode standard, supporting 2,823 distinct pictographs, including variations in gender, skin tone as well as flags. However, it generally takes time for the major software platforms and device manufacturers, such as Facebook, Google and Apple, to catch-up and support all the newly-approved emoji. To date, for example, Facebook supports 2,666 of the possible 2,823 emoji. For this year’s World Emoji Day, celebrated on the 17th July of every year, Facebook announced that 700 million emojis are used every day within social media posts and a further 900 million are shared daily without any accompanying text message, such as the international appeal of these pictographs. To appreciate the significance of emoji within a contemporary popular culture, one need only look back at the controversy that erupted in 2015 when the Emoji Council of the Elders approved a new pictograph depicting a smiling pile of brown poo; a recognised Japanese symbol for luck . The software giant Microsoft decided not to give their respective poo emoji a face because the company wanted to strictly adhere to the default definition, arguing that ‘the Unicode description does not indicate that this code point represents lucky golden poo.’ InsteadMicrosoft provided users with an emoji that represented ‘merely a pile of faeces’. This decision initiated an online hullabaloo within Microsoft’s user-base, many of whom complained that the company’s poo emoji looked too much like ice-cream, albeit after a child has dropped it off its cone. Inevitably, the Internet world was highly entertained when a leaked internal memo from Microsoft described in noteworthy, some would say repugnant, and colourful detail how the poo emoji should never be mistaken for either vanilla, chocolate or strawberry ice-cream. Sometimes, mere words are not enough. Hadrian J Sammut works with the local firm of iMovo. When not writing about poo and ice-cream, he can often be found working on Customer Experience Management and Business Analytics engagements. ([email protected]).